The City of Johannesburg has scheduled a Billing Open Day on Saturday, 12 August to enable ratepayers in Region B to resolve lingering billing issues. These highly concentrated Billing Open Days will be replicated in all regions of the Metro in upcoming months, as the City steams ahead to reduce the backlog of incorrect accounts in its SAP system. “Billing Open Days are designed to rectify anomalies in municipal accounts and help the City improve its customer database,” says Professor Rabelani Dagada, the Portfolio Head of Finance in the City of Johannesburg. “There are countless property owners who should be paying for municipal services but are not doing so, we urge them to come forward so we can remedy their billing issues,” Dagada says, adding that resolving billing woes will improve revenue collection. The MMC says Billing Open Days will give ratepayers a platform to interact with revenue frontline staff, who’ll assist them to remedy or update their municipal accounts. “This is also a chance for all stakeholders to take up their concerns with senior management in the City, who will ensure each account receives the desired attention,” he explains. The planned Billing Open Day in Region B is expected to improve relations between the municipality and its ratepayers. “We expect ratepayers to come out in droves so that City officials can assist them to resolve long-standing billing issues,” Dagada says, adding that the exercise is also tailored to help ratepayers reduce their debt with the city. 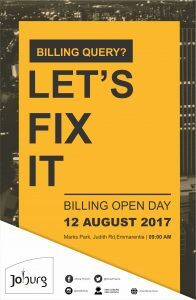 The desired outcome of the billing open day is to compile an accurate indigent register, introduce mechanisms to improve billing and revenue collection and improve the turnaround time for query resolution. Billing woes began when 16 independent Councils amalgamated to form the City of Johannesburg some 17 years ago. When the previous administration upgraded its revenue collection software to streamline operations, the process was bungled, resulting in glitches in its rollout. “Customers began receiving inflated and inaccurate municipal accounts for rates and services. Resource mismanagement in the revenue department is also to blame for having perpetuated the crisis,” MMC Dagada explains. This historical problem has since created a backlog in the operations of the revenue department. The Executive Mayor, Herman Mashaba has already taken full responsibility for the lingering crisis and has committed himself to alleviate billing issues whilst curbing the City’s increasing debt. Since the new administration took office, work has continued earnestly to remedy all anomalies in the system. Going forward, the City will conduct a frequent audit of properties and meters; enforce consequence and performance management, recruit skilled and qualified professionals and implement the SAP system successfully. Plans are afoot to establish a Revenue Nerve Centre to coordinate efforts and interventions across the revenue value chain. “Our vision remains to deliver a financially sustainable and well-run City, in a caring and professional manner,” MMC Dagada says. The Billing Open Day will be held at the Marks Park Sports Club in Emmarentia, Region B. Presentations on how the City inherited the billing crisis and its plans to fix it have been prepared for the day, including exhibitions by various departments and municipal entities. Exhibitions by municipal entities will focus on services offered by the City, including Social Development, Emergency Management Services, Pikitup, the Joburg Market; Joburg Water, Johannesburg Metropolitan Police Department, the Johannesburg Roads Agency, City Parks and Zoo and City Power. All corporate account holders and ratepayers who are 60 days or more in arrears or have a query on their account should attend this billing open day. “We’re dedicated to fixing the billing crisis in a caring and responsive manner,” he says. MMC Dagada notes that collecting more revenue will increase the City’s expenditure on infrastructure projects whilst delivering quality basic services to all.